These attractive Glaro open top wastebaskets and waste receptacles are economical, easy to use, and easy to clean. This large collection of heavy duty aluminum and steel metal waste baskets has a full range of sizes, shapes, and finishes. Glaro wastebaskets and open top waste receptacles are just the right choice for placement in rest rooms, hotels, healthcare facilities, offices, lobbies, hallways, cafeterias, vending areas, pools and health clubs, industrial facilities, religious centers, educational locations, residences, and any other public place. Bathroom waste baskets for residences and waste paper baskets for commercial office space are especially cost effective and space efficient options when researching smaller waste receptacles. 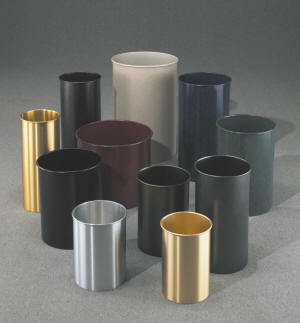 Easy to maintain wastebasket and waste receptacle finishes consist of satin aluminum (with a clear protective coating), satin brass (tarnish proof and rustproof), and 29 textured or smooth powder coat finishes baked onto galvanized steel. These waste basket receptacles are available for shipment directly from the Glaro factory within one to three days. Every unit features a rustproof aluminum bottom that will stand the test of time. All open top wastebaskets and waste receptacles may be color matched with all other Glaro products and are perfect for indoor and outdoor use. 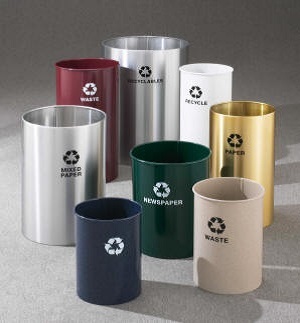 Optional messages or logos may be silk screened on the body of any open top aluminum wastebasket or waste receptacle. In addition, optional durable clear poly liner bags, (the LB Series), are available for all Glaro wastebaskets and waste receptacles to insure a neat and clean appearance.